On Friday, December 22, 2017, SpaceX’s Falcon 9 rocket delivered the fourth set of 10 Iridium NEXT satellites in a series of 75 total satellites to low-Earth orbit for Iridium, a global leader in mobile voice and data satellite communications. A Youtube user Jim Mudgett published an amazing footage of the Falcon 9 rocket launch. Enjoy! SpaceX Falcon 9 Iridium 4 Launch. December 22, 2017. At 40 Seconds into the video where the Falcon 9 crosses the contrail of a passing plane, the Falcon 9 is going approximately 5,000 Km/h and is at an altitude of 47 km, way above the passing plane that is probably at an altitude range of 5-10 km. The rocket lifted off from Vandenberg Air Force Base in California, United States (north of Los Angeles). Here is the official footage of the Falcon 9 Rocket launch (Iridium 4 mission), published by SpaceX, the American aerospace manufacturer and space transport services company. Previously, Falcon 9’s first stage for the Iridium-4 mission previously supported the Iridium-2 mission from SLC-4E in June 2017. 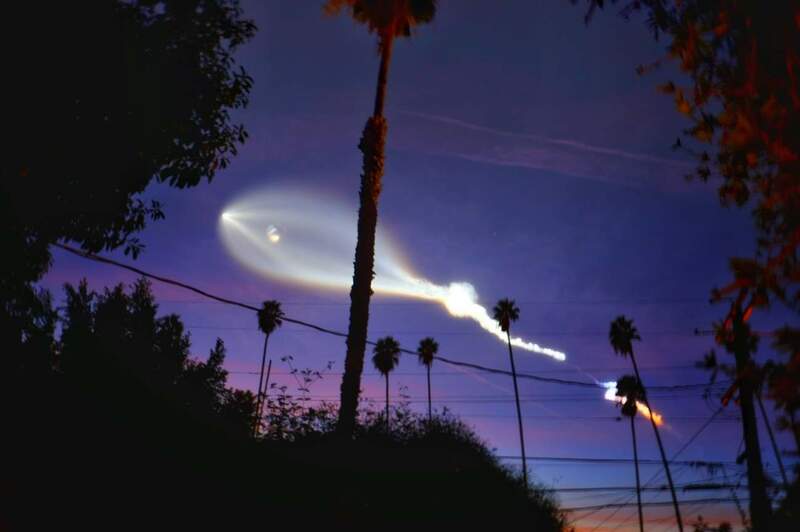 Photographer Erica Kelly Martin captured this amazing view while the rocket soaring over the palm trees of Hollywood, California. Another amazing timelapse of the launch, shot by photographer Jesse Watson from Vandenberg AFB as seen from Yuma, Arizona. Watson says: “I’ve been following the SpaceX launches online for some time now and have been in awe of the footage I’ve seen. I found out about this specific launch from Vandenberg Air Force Base a few days prior to the event. I wanted to capture this amazing spectacle in a fashion that I haven’t seen previously, as most of what I have seen is cell phones video or news reels. I arrived about two hours before launch time (1827 Arizona time) to have my gear prepped and ready for action. I started rolling the time-lapse sequences about 45 minutes prior to launch to capture some lead in the footage. 1827 came by and I didn’t see anything, I was a little disheartened at first thinking maybe it wouldn’t show up or that something happened and they did not launch but continued to roll the time-lapses. Then after what seemed like ages, but in reality, probably only a minute or two the Falcon 9 rocket blasted into the horizon and my cameras’ field of view. Why Falcon 9 Rocket Launch looked so strange? Dr. J. Marshall Shepherd, a leading international expert in weather and climate, explained that on Forbes. Every rocket exhaust (also plane exhausts) contains water vapor. This water vapor immediately exposed to very cold temperatures at very high altitudes. This is called “contrails” (Condensation trails). Condensation is the change of the physical state of matter from gas phase into liquid phase, and is the reverse of evaporation. The view of contrails were so spectacular at this particular launch, because, on the ground, the sun have set about 30 minutes earlier, but, the rocket was at such a high altitude that the sun was still shining on the condensing cloud. It was a cloud glowing with daylight, arcing across a darkened sky. The Iridium satellite constellation provides voice and data coverage to satellite phones, pagers and integrated transceivers over the Earth’s entire surface. Iridium Communications owns and operates the constellation, additionally selling equipment and access to its services.